No whinging about it being hot and dry here at Hayefield this month. Since August’s Bloom Day, we’ve received 16.95 inches of rain, which is *way* more than enough, thank you very much. The lack of sunshine has held back the fall extravaganza a bit, but it’s still pretty colorful around here. At this time of year, overview shots of the garden look better than closeups. And the middle path in the side garden. And two very nosy alpacas. Sorry, boys, no treats for you right this minute. 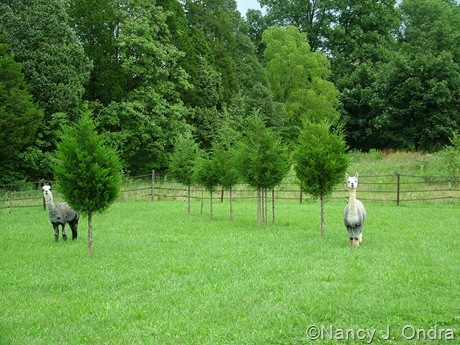 Poor little beasts – nothing to eat but all that lush green grass. After that restful moment, let’s see if we can find something more colorful. Oh, yes – that’ll do. 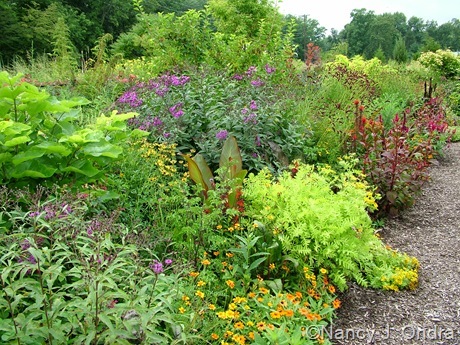 Above, ironweeds (Vernonia) and spiky celosia with ‘Isla Gold’ tansy (Tanacetum vulgare), golden catalpa (Catalpa bignonioides ‘Aurea’), and ‘Profusion Orange’ zinnias. 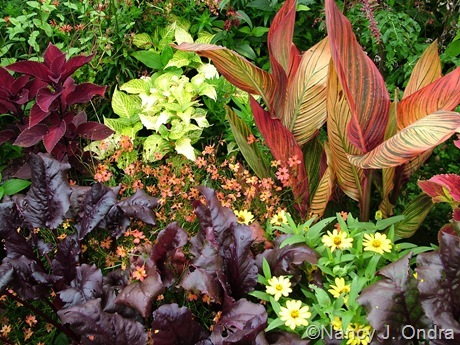 Below, from another angle, the golden catalpa, ‘Isla Gold’ tansy, ironweeds, a dark-leaved canna, and cardinal flower (Lobelia cardinalis). 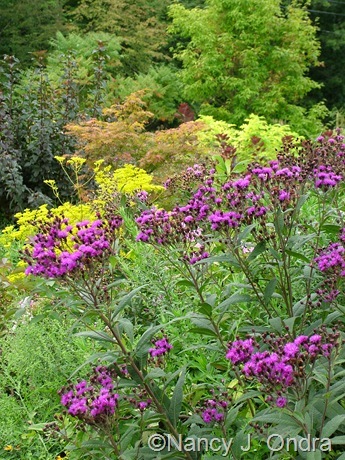 Above, Mellow Yellow spirea (Spiraea thunbergii ‘Ogon’) with ‘Lady in Red’ Texas sage (Salvia coccinea), ‘Sweet Caroline Bronze’ sweet potato vine (Ipomoea batatas), ‘Golden Delicious’ pineapple sage (Salvia elegans), ironweed, and ‘Velvet Cloak’ smoke tree (Cotinus coggygria). 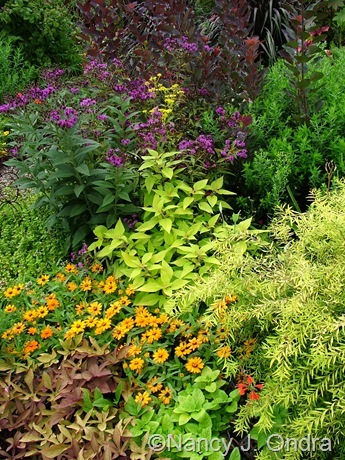 Below, ‘Bright Lights’ Swiss chard with Limemound spirea (Spiraea x bumalda ‘Monhub’), purple heart(Setcreasea pallida), classic zinnias (Zinnia angustifolia), ‘Profusion orange’ zinnias, Mellow Yellow spirea, and Diabolo ninebark. 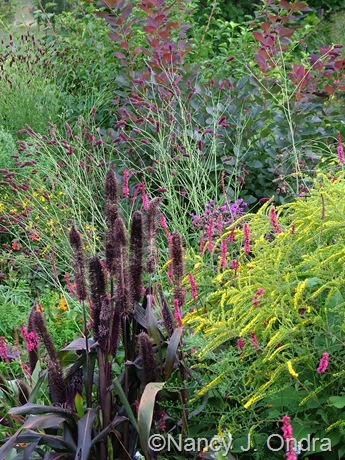 Above, ‘Jester’ millet (Pennisetum glaucum) with ‘Fireworks’ goldenrod (Solidago rugosa), ‘Taurus’ mountain fleeceflower (Persicaria amplexicaulis), Japanese burnet (Sanguisorba tenuifolia), and ‘Grace’ smoke tree. 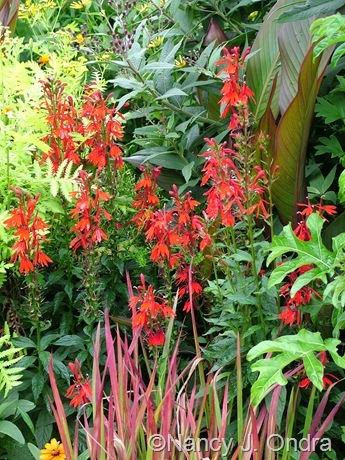 Above, cardinal flower and canna with Japanese blood grass (Imperata cylindrica ‘Rubra’). 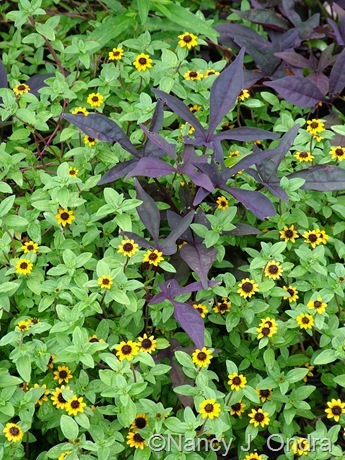 Below, ‘Mandarin Orange’ creeping zinnia (Sanvitalia procumbens) with a self-sown sweet potato vine. Above, “from Villandry” marigolds and ‘Isla Gold’ tansy with ‘Black Velvet Scarlet’ geraniums (Pelargonium x hortorum), ‘Black Prince’ snapdragons, and a purple-leaved wandering Jew. 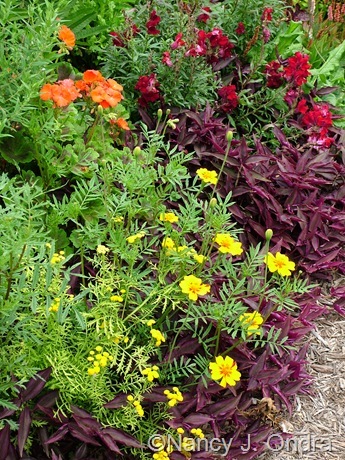 Below, Tropicanna canna (Canna ‘Phaison’), ‘Limerock Dream’ coreopsis, and ‘Bull’s Blood’ beets. Some closer shots…above, an ironweed, and below, golden lace (Patrinia scabiosifolia). 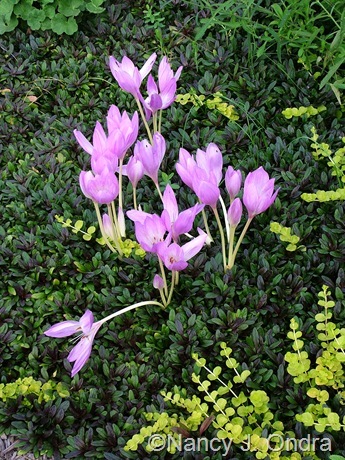 Above, ‘Violet Queen’ autumn crocus (Colchicum) with Chocolate Chip ajuga (Ajuga reptans ‘Valfredda’) and golden creeping Jenny (Lysimachia nummularia ‘Aurea’). Below, Korean feather reed grass (Calamagrostis brachytricha) against Diabolo ninebark. 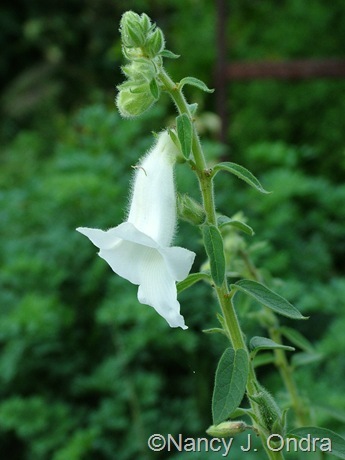 Above, sunset hyssop (Agastache rupestris); below, white African foxglove (Ceratotheca triloba ‘Alba’). 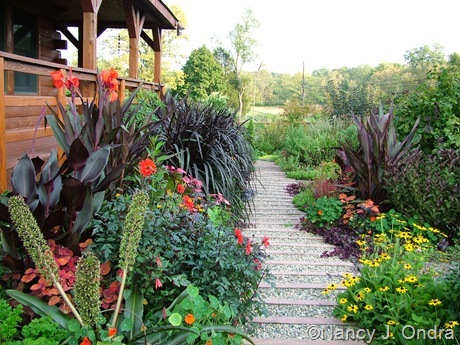 Above, ‘Vertigo’ elephant grass (Pennisetum purpureum) and ‘Wyoming’ cannas; below, variegated pokeweed (Phytolacca americana ‘Silberstein’). 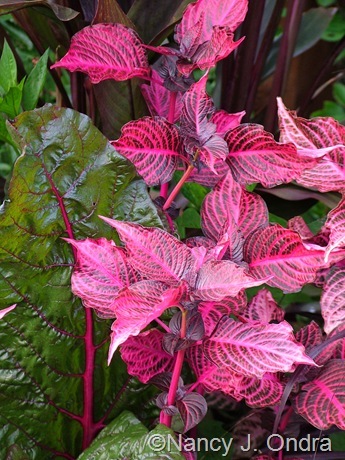 Above, ‘Sedona’ coleus with chard; below, ‘Blazin’ Rose’ beefsteak plant (Iresine) with chard. 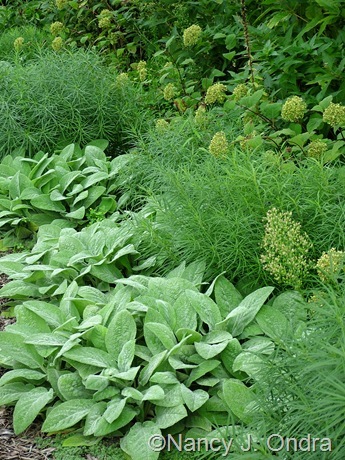 Above, ‘Big Ears’ lamb’s ears (Stachys byzantina) with Arkansas bluestar (Amsonia hubrichtii) and Invincibelle Spirit smooth hydrangea (Hydrangea arborescens ‘NCHA1’). 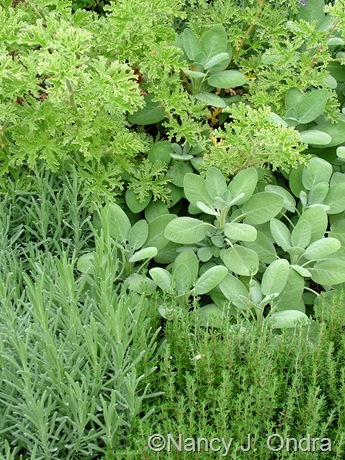 Below, ‘Berggarten’ sage (Salvia officinalis), common thyme (Thymus vulgaris), ‘Grosso’ lavandin (Lavender x intermedia), and ‘Gray Lady Plymouth’ scented geranium (Pelargonium). 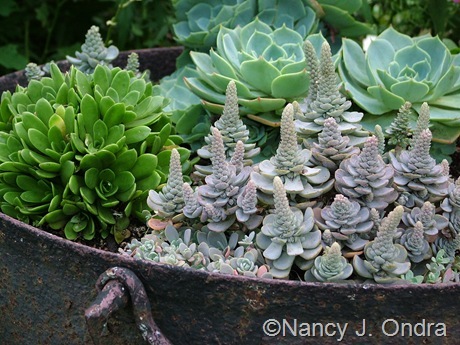 Above, duncecaps (Orostachys iwarenge), Orostachys malacophylla, and blue echeveria (Echeveria glauca); below, firesticks (Euphorbia tirucalli). Above, widow’s tears (Tinantia erecta); below, black-leaved cotton (Gossypium herbaceum ‘Nigrum’). And one more: Tropicanna canna with ‘Bellingrath Pink’ (a.k.a. 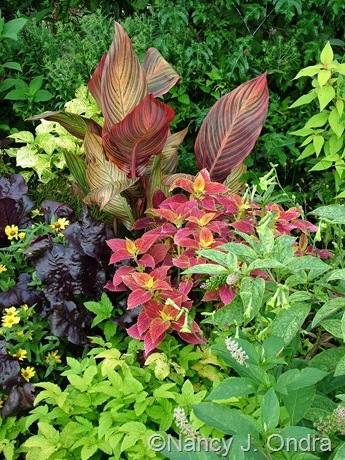 ‘Texas Parking Lot’ and ‘Alabama Sunset’) coleus, variegated pokeweed, golden meadowsweet (Filipendula ulmaria ‘Aurea’), and ‘Bulls Blood’ beets. 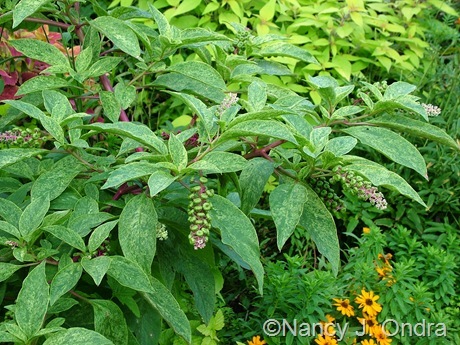 To see what’s flowering today in other gardens around the world, check out Carol’s main Garden Bloggers’ Bloom Day post at May Dreams Gardens. 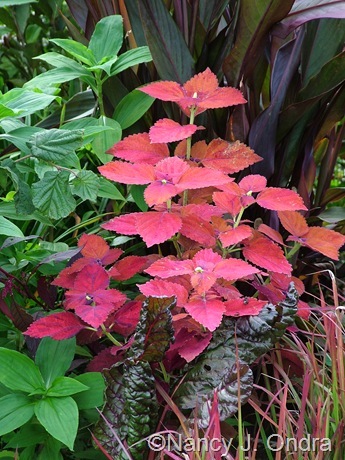 And for more lovely leaves, visit Pam’s Foliage Follow-Up post at Digging on September 16th. Your lush garden is incredibly inspiring. Your plant choices amaze me. Just keep on doing what you’re doing. Hi Patrick! I have to admit to be very pleased with how the garden looks overall. For me, August through October are the very best months of the year. Thanks for visiting! Hello, a very interesting new post with beautiful colours combinations ! I love your garden. I’m still looking for Gossypium herbaceum ‘Nigrum’ seeds and no result at all in France or Europe. Could you give me an US name society for buying these seeds please ? Hi Nicole – unfortunately, no one that I know of is selling either plants or seeds of the black-leaved cotton in the U.S. I can’t imagine why; it’s such a stunning plant. Mine have lots of pods, but I won’t know if I’ll have seeds to share until late fall. Your garden is always an inspiration. Just when I need a little nudge to do something I get a big shove here. Happy GBBD. Thanks, Lisa. I just wish I could share our excess rain with those of you who are still dry. Happy Bloom Day to you too! 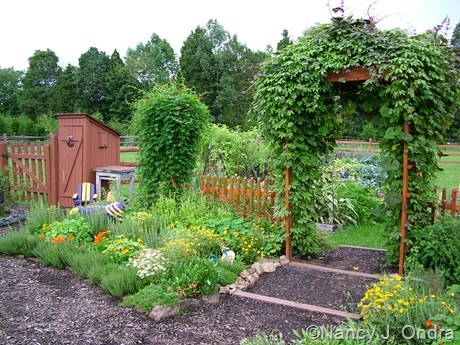 Dear Nan, seeing your garden is always a favorite way to greet the day. The rain has been a blessing here, as well, eighteen inches in the same time frame, all in three days. Happy Bloom Day! Yow, Frances: all that in three days? At least our rain was spread out rather more over the month, with more last night and today. If we can squeak through the next few nights without frost, things should be set up for a great fall up here – and for you too, I hope. I love your “combos”, especially the ones with Cannas which inspired me to buy some this spring. The green leaved and striped ones have been really nice, but I haven´t find the red leaved – and I have no idea at all where I put them! Oh no, Susie – it’s so sad that your red-leaved cannas disppeared. Maybe they’re there but just hiding; sometimes small pieces can stay very short the first year, especially in cool conditions. You might find then at cleanup time, which imagine will be pretty soon for you. I enjoyed my morning trip through your Penn gardens, always a riot of color. Can you tell me about patrinia? It’s such a bold shock of chartreuse in your photos. 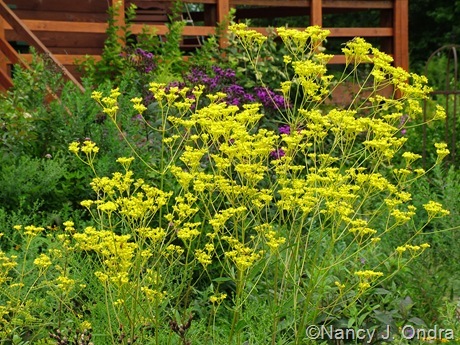 Also, does fireworks goldenrod spread in the same way as the wild goldenrods? You are quite an inspiration to me! Isn’t the patrinia just lovely? It’s been in bloom for about a month now and will continue to look good for a few wore weeks, then develop amazing red and orange fall colors. Hardiness is about Zones 4 or 5 to 8. I should mention that patrinias can be alternate hosts for a fungal disease that affects daylilies, so some people avoid planting them. According to the American Hemerocallis Society, there haven’t been any reports of rust-infected patrinias in the U.S. (http://www.daylilies.org/ahs_dictionary/daylily_rust.html), but I figured I ought to pass that along. I’ll collect seed again this fall; let me know if you want to try some. The ‘Fireworks’ goldenrod forms broad, expanding clumps, not runners, so it’s been very well behaved for me. Have a great fall, Brenda. Love your garden. Please post more often. I too can’t find the black cotton plants/seeds either. Thanks so much, Melanie. I doubt the people who subscribe to Hayefield by e-mail would appreciate me cluttering up their inboxes with megaposts more than twice a month! 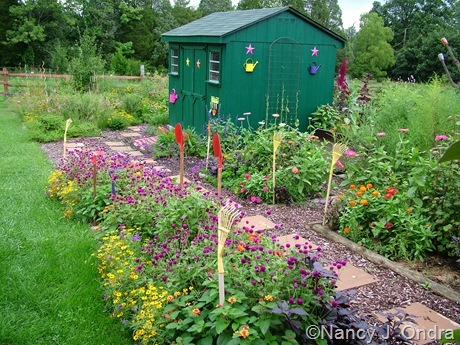 I would love to see your garden in person. Great combinations. My southern garden is not very colorful at this moment so I celebrate foliage. Thanks for sharing, it inspires me. Hi Erica! I’m honored to have you visit. I too am a big fan of foliage. It’s the only thing that got me through our difficult June and July, and it’s even better now with all the richly colored flowers coming out. You have created a garden paradise. I love the way you use canna. It inspires me to be more creative with this spectacular plant. I usually line them up along a blank wall – boring. Maybe next year I’ll get out of my rut LOL. 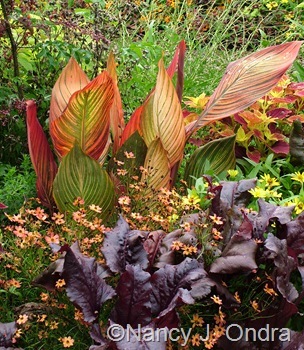 Hi Marie – the reddish-leaved canna in the shot with the ‘Isla Gold’ tansy is part of the batch you shared with me last fall. They’re doing great. Thanks so much for sharing them! 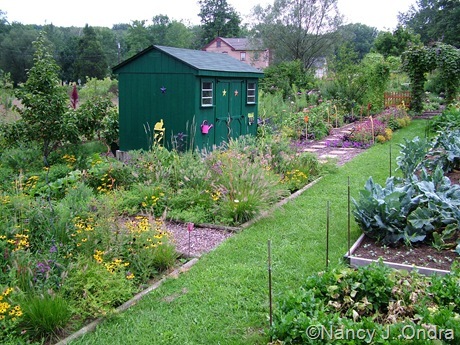 Nancy – I love your books and I love getting the current peek at the garden. I’m hoping we escape the frost, too. Thanks, Pat! We’re supposed to get down to the low 40s for the next few nights, but if we’re lucky, the frosts will stay away for a few more weeks. Wow, that is amazing! 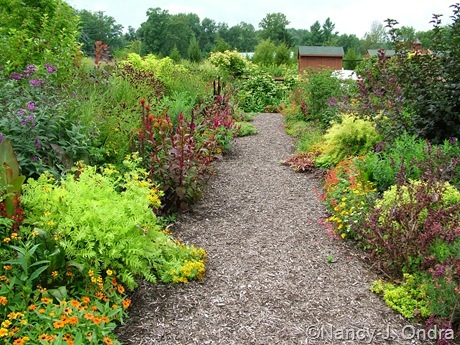 A great reminder that a garden should not consist of a lot of bark mulch with a few plants sprinkled in. So, you don’t worry about overplanting, do you? What is this “overplanting” of which you speak, TM? Perhaps it is what I think of as “mulching with plants”! It amazes me too, Larry. For most of the summer, I had little hope of getting a decent fall display. But once again, the plants have done their glorious best. 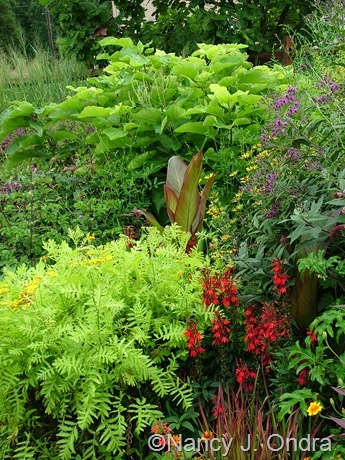 Your garden is such a vision of colour and lushness! Its always a treat to be given a personal tour of the paradise you’ve created! Thank you! Looks like you have no lack of color in your spring garden, either, Christine. Happy Bloom Day to you! 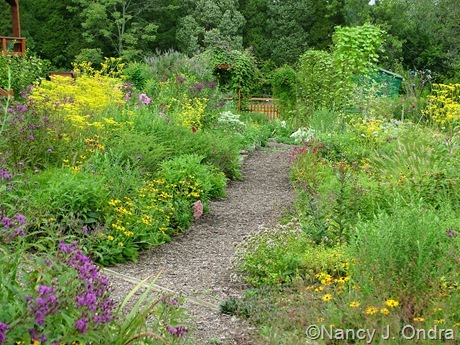 I adore your cutting garden/meadow garden creation from conception to finalization. It looks like such a relaxing area to mull around and gather things for an indoor bouquet. Sunflowers! Now, that’s something I really must plant more of next year. Thanks for the reminder, Donna. Blood grass is not a problem for me here in mid-Zone 6. I wish it would spread more, in fact. Each year, I lose a few and gain a few, so my patches have stayed pretty much the same size over the last 7 or 8 years. 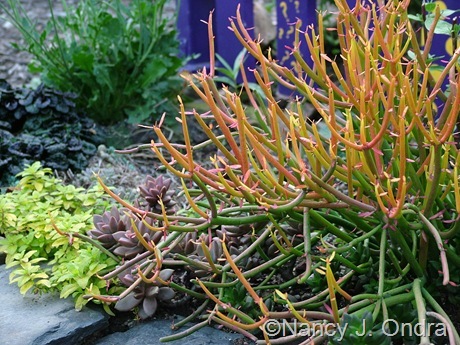 The duncecaps are in a container; the firesticks are in the ground. I dig both up in fall and overwinter them in the basement. I did find a few tiny baby duncecaps in the ground underneath the container this spring, though. The original plants flowered heavily last fall, so maybe they self-sowed a bit? So my dream for Firesticks goes in the gutter! There is one piece of gardening mystique that I haven’t yet seem to manage – the elusive “storing inside for the winter”. /sigh. Many an Elephants’ Ear have I lost to sheer forgetfulness…. My Sunflowers are planted by my backyard Squirrel! I have no part in that. But I take the flowers for vases anyway – he nor the Gold Finch’es mind. Hee hee! If you have room for a houseplant, maybe you could keep the firesticks that way? Mine was really unhappy at 40-50 degrees, with just a few hours of sun and long periods without any water. It looked a lot more like deadsticks when I planted it out in early June, but after a bit of trimming and some warm weather, it came back quite quickly. What a glorious garden you have. I am drooling. I’m sorry to be responsible for your slimy keyboard, Dorothy, but I’m glad you enjoyed your visit! I tell you right now Nan, you are positively encouraged to clog up my inbox with as many posts per month as you see fit. The more the merrier I say! 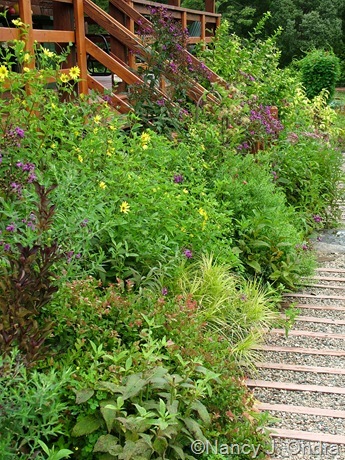 Your garden is looking stunning – such an inspiration. 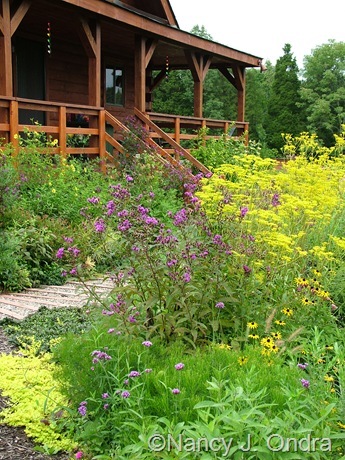 I have decided to use your perennial meadow idea for a 60m long border near my large pond. The colour scheme there is lime/gold, black and maroon/dark red. The emphasis is on foliage with hits of deep red flowery things. I thought I’d use bronze fennel, lime green lomandra grass, purple fountain grass, black leafed-red flowered cannas (I have Australia and America), plus ‘cherry brandy’ Rudbeckia and burgundy coreopsis. I’d love to chuck some ‘Isla Gold’ tansy in there too… can’t seem to find it in NZ though. So much food for thought – thank you! Oh, you say that now, but I’m sure you’d get tired of hearing from me as often as I’d post if I didn’t also have to write for a living. 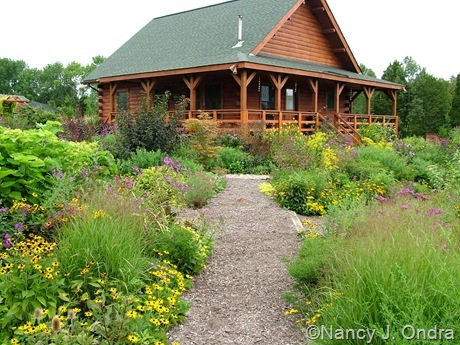 I hope you’ve checked out Michael King’s blog to get more inspiration for your perennial meadows. Your color theme sounds amazing. I wonder if you have access to Patrinia scabiosifolia? That would look great with your other choices! I was just thinking that it would be gorgeous with your other dark plants! It’s just now become available here – maybe you’ll get it in a few years? No Patrinia I’m afraid. But I thought a lemon Achillia might work and/or parsnips. 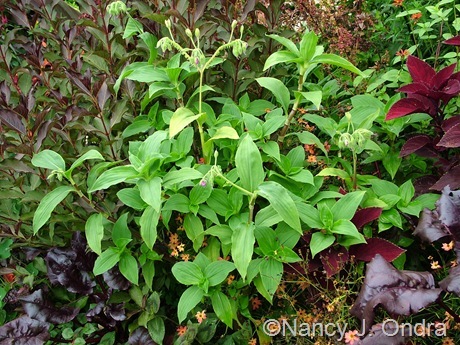 And I’ll also throw some lime green Nicotiana langsdorfii seeds throughout too. Yes, Mr King’s blog has been well perused, thanks for the links. I’m in awe – such a beautiful blend of color and texture! Thanks, Ginny. I’m already looking forward to next month. Hope you have a great fall too! Considering the dry summer you have a spectacular display in the garden this fall Nan. It seems the place is packed with one “wow moment” after another. Scrolling through the photos was like watching a fireworks display with each image more beautiful than the next and accompanied by the appropriate “oohs” and “aahs”. I really like how the Phaison canna and Limerock Ruby coreopsis play off one another and then the deep note of whatever dark purple thing that was in front of it. I have made a mental note to add ‘Isla Gold’ Tansy, ‘Mellow Yellow ‘spirea and ‘Vertigo’ pennisetum next summer. But then how can I live without duncecaps and firesticks??? And the list goes on! That’s great, Kate – just the effect I was hoping for. I cut out a lot to leave just what I thought was best at the moment. I’m glad I tempted you to add some plants to your wish list. The ‘Vertigo’ is my favorite new plant this year. It got *way* larger than I expected, but it’s all the more spectacular for it. If only it were hardy…. Nan, your posts is always the highlight of Bloom Day! 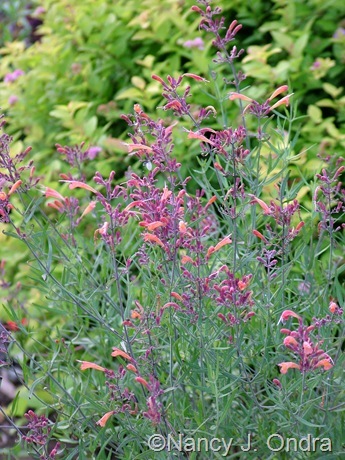 Skipping to foliage first, though…you are always challenging us to rethink plant usage…the ‘Berggarten’ Sage…stupendous…I almost thought it was a Cotinus for a split second…the foliage is so very lovely! Your photo of the Amsonia has convinced me that I must cut mine back next year…those compact balls of foliage are so much more appealing than mine (which is threatening to consume it’s neighbors!). 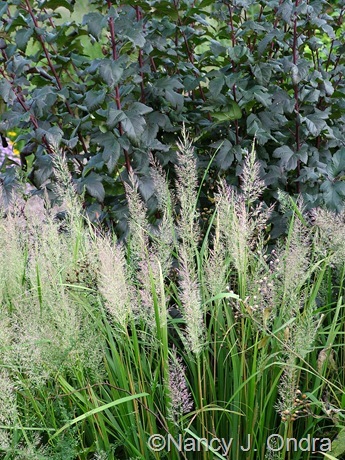 The Calamagrostis brachytricha backed by the Ninebark is especially stunning in it’s subtlety. 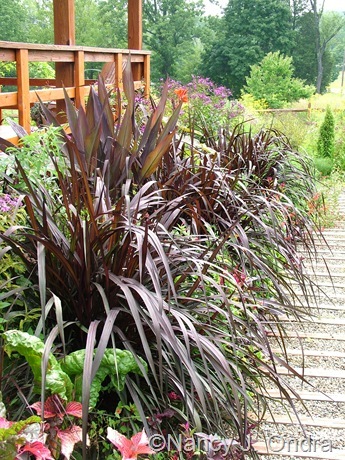 Love how you’ve massed so many darker-leaved plants near the porch…it’s such a rich, sultry look :-) That dark Pennisetum….serious, smouldering gorgeousness! You picked out many of my personal favorites, Scott. 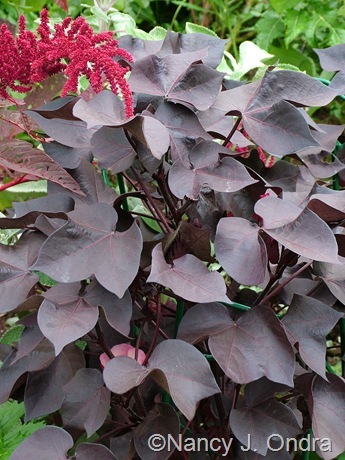 Mmmm…can you imagine a silver-leaved cotinus? That would be outstanding. And yeah, I’d hoped that the front foundation border would be red and black, but the ‘Vertigo’ ended up filling almost the entire space. It reminds me of a dark-leaved phormium, although we’d never have a phormium get that huge out here! I would love to try some Patrinia seed! Can’t find this plant in nurseries. How do I get the seed? I’d be glad to send you some this fall, Priscilla. 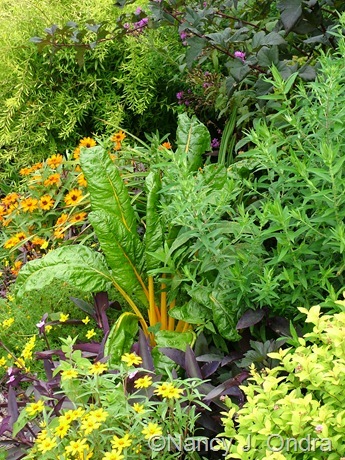 Your garden looks so healthy! 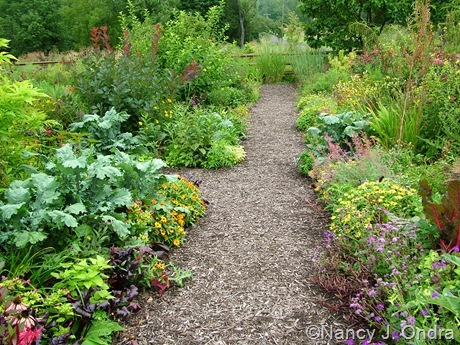 And your paths are very much an inspiration for a school garden I am hoping to get done this year. Thanks for sharing! Thanks so much for visiting, Maria. Good luck with your garden project! Thanks, Ilene. I hope you’re enjoying our spectacular fall weather as much as I am! Incroyable la lumière et le contraste aportés dans vos massifs par des feuillages si bien choisis ! Je me régale en venant régulièrement m’inspirer de vos associations de plantes. Je note les noms et je vais ensuite faire mes petites recherches sur les sites francophones. BRAVO Nan, le résultat est spendide ! Merci, Manuechao! I’m so glad to know that you enjoy the combinations. And it’s always a pleasure to hear from another gardener who appreciates beautiful foliage. As always, your garden is a feast for the eyes. Nan, I’ve learned so much from you (and your books) and you’ve had such an impact on the way we garden. 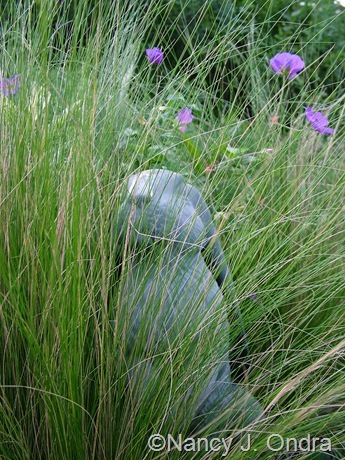 We even have some purple fountain grass in the front cottage bed now! (Never thought I’d see the day I’d be planting grass in my Gertrude Jekyll garden LOL.) Thanks for the inspiration! Oh my, Cathy – what would Gertrude have thought of that? But if it makes you happy, that’s all that matters. Enjoy! Hi Nancy: Wow what a jolt of intensity, inspiration, and energy. I’m in awe. I must introduce my colchicums to ajuga, too! Hey there, Louis! Thanks for stopping by. Yes, the ajuga-and-colchicum combo has proven to be a good one.